Your go-to guide for picking window treatments. Often times, the final step in making a space feel luxurious and complete (like dealing with your windows) isn’t a choice—it’s a necessity. Think of your window treatments as the period (or exclamation point) to a well-designed room. While the average passerby may never glance twice, to the expertly trained eye, great window treatments can make all the difference. That said, finding the right treatment for your space (are you looking for shades, blinds, or drapes?) can be an especially intimidating feat—especially if you’re taking scissors to fabric yourself. To shed some light on the world of window treatments, we asked two design pros to answer your most common curtain questions. What do I need to assess before I shop? Not unlike buying a sofa or another statement piece of furniture, window treatments can carry a lot of weight in a room. But because they’re often the last “to-do” on your checklist, it’s important to take into account the existing colors, textures, and shapes within your space. For instance, if you’ve already got a lot of pattern going on elsewhere, you may want to consider sticking with something more neutral. If blending in is your main priority, consider picking a fabric color that is the same tone as the wall, or perhaps a few shades darker. Going off other shades in the room—be it the color of your rug or sofa—is also a great place to start. Nailing down which treatment is right for your space totally depends on personal, stylistic preference as well as budget and functional needs. To save you the stress of sorting through the masses, here’s the basic gist to the most common types of coverings. Blinds are typically hard window treatments comprised of several long horizontal slats that can be tilted open or closed. While they often require a frequent dusting, they’re super functional and extend a sleek and simple look. If your style falls somewhere along the lines of minimal-organic, wood blinds are a great pick that promise to lend a natural, airy aura. However, if there’s little room in your budget for the real thing, faux wood blinds can mimic a similar feeling. Just as their name suggests, mini blinds feature smaller slats that are typically about one inch thick. Micro blinds boast even tinier slats that are usually half the size. Consider this a simple and affordable way to block the sun and provide sufficient privacy. A popular choice for large windows and sliding glass doors, panel blinds are a hybrid between drapery and vertical blinds that move along a track. For that timeless country chateau feel, you can’t go wrong with classic shutters. Not only are shutters an incredibly classic way to add character to the bathroom or kitchen, but they also help to control incoming light and insulate against heat, cold, and sound. While it’s common to use curtains and drapes synonymously, curtains typically imply the use of a lighter and thinner fabric that is not lined and won’t block the sun. Curtains are a great way to add a small decorative touch to a room that doesn’t require total privacy. Drapes, on the other hand, are made up of thicker, full-length panels of fabric that help insulate a home and block light. Unlike blinds, shades are raised and lowered by a cording or spring system. In their most basic form, shades are typically the most inexpensive window covering you can opt for. However, there are a number of beautiful iterations that pack a more design-friendly punch, including woven wood shades, roman shades (these give a rich impression of drapery), roller shades (these roll onto a cylinder at the top of the frame), and sheer shades. What kind of measurements do I need to take beforehand? “For curtains, you’ll need to measure the width of your window (trim to trim) and the length you’d like (rod to floor),” suggests Gibson. If you’re hanging curtains or drapes that require a mounted bracket on the wall above, the first thing you’ll want to do is figure out how high you want to hang your rod. As a general rule of thumb, mount the rod four to six inches above the window frame—or halfway between the frame and the ceiling molding. This will also help create the illusion of a taller window and allow the fabric to fall gracefully. Once you’ve got your height and width down, don’t forget to account for other variables. “Subtract one inch to account for rings and add 16 inches for header and hem allowance,” Yokota suggests. How long should my curtains actually be? Curtains that only slightly hit the floor communicate a classic, tailored, and flexible look. Note that it’s also much easier to open and close your curtains with ease when they just kiss the ground. If you like the look of drapes that pool at the floor, a spare one to three inches will give you the relaxed and romantic look you’re going for. In more formal spaces like the living room or dining room, a dramatic puddle can make for a wow-worthy moment. How wide should my curtains be? When you close your curtains they should never be crease-free. Even when shut, there should be a fullness to the fabric. To ensure that your panels look ample when you’ve pulled them close, make sure that they have a combined width that is at least two times that of the window. For a standard frame (32” to 36” width), this generally means that each panel of fabric should be 1 ½ times the width of the window. What are my rod options? In most cases, the rod is just as important as what hangs below. Think of this as your second opportunity to play with shape, color, and texture. Easy and cheap, tension rods are a favorite amongst college students and lazy decorators alike for the simple reason that they require no hardware for install. All you have to do is twist the bar to adjust the size and squeeze it into the frame. But beware: Tension rods are rarely sturdy enough to hold anything of substantial weight. Typically consisting of an adjustable pole with ornamental ends, this is probably the most popular, straightforward option for mounting curtains and drapes. With so many options available on the market, there are endless opportunities to play around with scale, finishes, and decorative detail. Is the sidelight sneaking through your standard rod giving you a headache? With their inward, U-shaped curve, return rods are a great way to stop any unwanted rays from entering your space. The main pro of having your drapes hang from a track versus a standard rod is that it’s never a battle to draw them open. 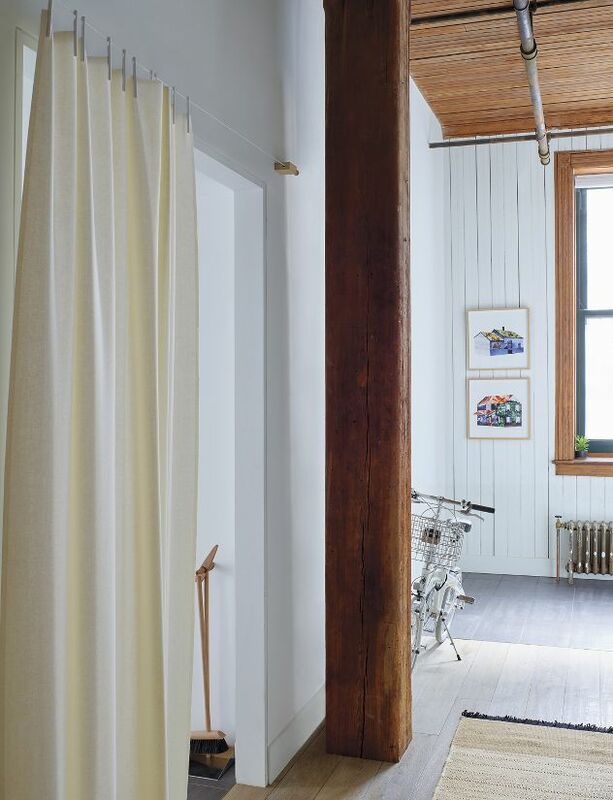 Connected to hooks that are attached to pulleys on a mounted track, the curtains hang from one smooth, continuous line. Where should I be shopping? If you don’t have the budget for having custom window treatments made, there are a number of big-name retailers that make a ton of stylish coverings in a range of patterns, textures, and materials. While there’s nothing quite like popping into a store and seeing and feeling the fabric for yourself, we get that online is sometimes your only option. “If you’re planning to purchase window treatments online, I’d highly recommend ordering samples before determining the fabric, and carefully research how the company prefers you to measure,” shares Gibson.